Good Materials – Choosing the right materials from the outset. If our products are going to be the raw materials of the future, we must construct them wisely. Tandus Centiva chooses good materials for the design of our products that respect people’s health and the environment and can be either reused safely by nature (biodegradation) or industry (recycling) at the end of product use. For Tandus Centiva, ‘Good Materials’ means: Abundant, rapidly renewable, recycled and recyclable, respecting people, health and the environment. Material Assessment – In order to optimize products, you must first understand what you have. As a Tarkett company, Tandus Centiva has all raw materials assessed according to the Cradle to Cradle® Material Assessment protocol. By undergoing third-party assessment, we are learning about the chemistry of our raw materials, defining a list of positive ingredients that can be used in our global supply chain and driving innovation where we see opportunities for improvement. For us, C2C is not just about certification or transparency, it is a strategic path for material health and optimization. Supply Chain Engagement - It takes a village. Effective supply chain engagement enables us to achieve ambitious sustainability goals, partner for innovation and reach beyond our own facilities and products to incorporate Cradle to Cradle® principles. Trusted relationships with long-term partners have allowed for transparency and innovation in materials technology. Tarkett is a signatory of the United Nations Global Compact. We are committed to adopting and implementing robust policies and procedures in the areas of human rights, labor standards, the environment and business ethics to counter corruption. Tarkett also encourages its suppliers to respect the UN Global Compact principles, either by signing the Global Compact itself or applying its principles of human rights, working conditions, respect for the environment and anti-corruption. Innovative Materials -We start with good materials, and strive to make them better. PVB – PVB is a recycled film polymer from windshields and safety glass. When damaged glass is replaced, it is recycled by separating the glass from the film and turning the glass back into glass. The film was once a waste stream. In 2004, We developed a process to make it into carpet backing for Powerbond ethos Cushion and ethos Modular products. It is recycled and recyclable. It meets the strictest chemical red list requirements and has enhanced performance and installation benefits. The ethos Modular products are Cradle to Cradle Certified™ Silver v3.0. PVB is a material for the future. Econyl - The recycled content in ECONYL® Nylon 6 yarn is composed of 50% postconsumer and 50% preconsumer nylon derived from fishing nets, fabrics and fluff from carpet. Modern vinyl – Not all PVC is created equal. For many years, PVC or vinyl has been a widely used material in the building and construction industry. It is affordable, durable and recyclable many times over. Over time, PVC or Polyvinyl chloride has received criticism as being a threat to people and the environment. We take that seriously and set out to not only understand the argument, but to listen and begin to make a better PVC. In 2011, Tarkett began working with Dr. Michael Braungart of the Environmental Protection and Encouragement Agency (EPEA), co-author of Cradle to Cradle. Michael Braungart is a chemist and long-time activist against PVC. He helped us to identify the main challenges of PVC products and develop a roadmap to address each and every one. For more on our actions: link to PVC newsletter Today Tandus Centiva makes many PVC based products using optimized materials. In 2010, we began introducing non-phthalate technologies into our LVT products and followed in 2014 with our vinyl-backed soft surface lines. Resource Stewardship – Make the biggest difference by doing the little things right. Tandus Centiva’s US facilities are ISO 14001 certified and have initiatives in place to optimize energy usage in manufacturing and operations. As part of its environmental commitment, Tandus Centiva has participated in the Green Power Switch program offered by its local utility provider in partnership with the Tennessee Valley Authority (TVA) since 2003. The program uses solar, wind and methane gas in addition to hydroelectric sources. Participation in the program allows Tandus Centiva to support the development and use of renewable energy in its community. The company also purchases green-e certified Renewable Energy Certificates (RECs) and carbon offsets as part of its greenhouse gas reduction program. RECs are tradable, non-tangible energy commodities that represent the environmental attributes associated with power produced from renewable energy projects. Tandus Centiva also purchases carbon offsets for its manufacturing facilities and as a part of its Carbonfree(R) Program. A carbon offset is a reduction in carbon dioxide or greenhouse gas emissions made in order to compensate for or to offset an emission made elsewhere. The Tandus Centiva facilities located in Dalton, GA purchases green-e certified Renewable Energy Credits (REC’s) in an amount equal to approximately 25% of the company’s total electricity usage. These RECs support 100% new wind turbine energy production. Each year new initiatives are introduced to reduce and offset energy usage, driving toward zero and then positive impact. CDP/GHG Inventory - Tandus Centiva annually performs a third-party verified greenhouse gas inventory and participates in the Carbon Disclosure Project (CDP). The Carbon Disclosure Project established a globally used standard for reporting Greenhouse Gas (GHG) emissions and energy and is the world’s largest repository of GHG and energy use data. Companies that participate in CDP publically report their GHG emissions and climate change strategies. CDP reports are assigned a “disclosure score” which reflects the quality and completeness of a company’s response. If a company report has a disclosure score of 50 or more, it is also ranked in a performance band that rates the company’s actions that affect climate change mitigation, adaptation and transparency. Carbonfree Certification - Now in its fourth year, Tandus Centiva’s Carbonfree® Flooring program allows customers the option to purchase their products as carbon neutral or “carbonfree.” For a nominal cost, Tandus Centiva customers can purchase carbon free Powerbond or modular flooring products through a registered and credible program. Tandus Centiva conducted extensive product Life Cycle Assessments (LCAs) to determine our products' per unit carbon footprint. Claiming a product is carbon free means that the greenhouse gas emissions related to the entire life cycle of the product have been offset. Working in conjunction with Carbonfund.org and NSF International, third-party validated carbon offset credits are purchased and retired to offset the greenhouse gases associated with the product's life cycle. For more information, contact your local Tandus Centiva account executive. A certificate will be provided to Carbonfree projects. Only 3% of the earth’s water is fresh. Of that, 2.5% is frozen in the polar ice caps. That leaves only 0.5% for drinking and industrial use. Tandus Centiva’s Dalton facilities have reduced water use by 77% per square yard of carpet manufactured since 1993, with the stated goal of utilizing closed-loop systems for its manufacturing water by 2020. Reductions have been achieved by leveraging closed-loop systems that reuse process water, investment in new efficient equipment and eliminating certain wet processes. In addition, Tandus Centiva has decreased its use of traditional dyed yarns and increased its usage of solution-dyed yarns. Florence Closed Loop - At the Florence, AL facility, Tandus Centiva has a closed-loop system for all water used in the manufacturing process. An ambient filter cools process water before it is placed into a holding pond where it is stored and then reused. The only water that is lost during manufacturing is due to evaporation. The US makes up less than 5% of the world’s population, yet is responsible for more than 19% of its waste. Postconsumer flooring waste -Tandus Centiva has a long history of environmental innovation, allowing us to pass on added value to our customers by being better stewards of our resources. We were the first in the flooring industry to reclaim and recycle soft surface flooring from the waste stream, the first to third-party certify a recycled content product and the carpet industry’s first to third-party certify a closed-loop reclamation and recycling program, now part of Tarkett’s ReStart® Program. On average Tandus Centiva recycles 10 mil pounds of flooring a year (27,400 pounds/day), totaling more than 284 million pounds since starting the program in 1994. Tandus Centiva was named CARE’s 2014 Recycler of the Year. Manufacturing waste - Tandus Centiva is diligent about waste elimination. In our manufacturing facilities, we employ the age old hierarchy of reduce, reuse, recycle. We have worked diligently to reduce unnecessary raw material packaging by engaging our supply chain. We have processes in place to repurpose and reuse items like wooden pallets and cardboard yarn cones. We recycle any remaining packaging, household waste, and manufacturing scraps both internally and externally. Today, we send less than 0.6% (of total production weight) waste to landfill. Our 2020 goal is ZERO waste to landfill, and we won’t stop until we achieve it. Quality products are produced by dedicated people who are supported by repeatable frameworks. As a leader in the flooring industry, Tandus Centiva’s commitment to continual improvement is evidenced by adopting standards set out by the International Organization for Standardization (ISO). Currently, our facilities in Dalton, GA, Calhoun, GA and Florence, AL are ISO 14001 certified. Additionally, our team in Florence is ISO 9001 and OHSAS 18000 certified. As a Tarkett company, Tandus Centiva is implementing the World Class Manufacturing (WCM) program in all of its sites. The objective is to increase competitiveness, improve customer satisfaction and deliver outstanding results in terms of safety and environment. To visit our world-class manufacturing facilities, visit us on The Loop Tour. People-Friendly Spaces – We work to make every environment a better place. The indoor environment is our dwelling place. As interior spaces become denser and begin to serve multiple purposes, we aspire to create actively beneficial, comfortable, safe environments through fit-for-purpose flooring solutions. You can’t see it but you know it’s there. The air we breathe provides life. The quality of air impacts our health and experiences either positively or negatively. At Tandus Centiva, we provide products that contribute positively to indoor air quality. Volatile Organic Compounds (VOCs) – One measurement of IAQ is the quantity and quality of VOCs found in the air. There are VOC emissions of some chemicals that can be harmful and should be avoided. All Tandus Centiva products are tested and third-party certified to ensure that we meet the strictest indoor air quality standards. One of the Tarkett 2020 Objective’s is to have all of our products and adhesives below 100 µg/m3 of TVOC’s. All Tandus Centiva LVT products are FloorScore® certified. 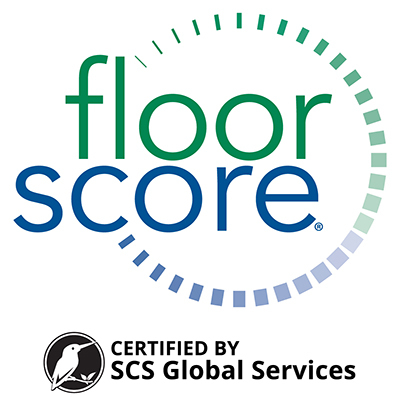 FloorScore® certification means that a resilient flooring product is independently certified by SCS Global Services to comply with the volatile organic compound emissions criteria of the California Section 01350 program. The FloorScore® certification means safer, healthier, cleaner air. 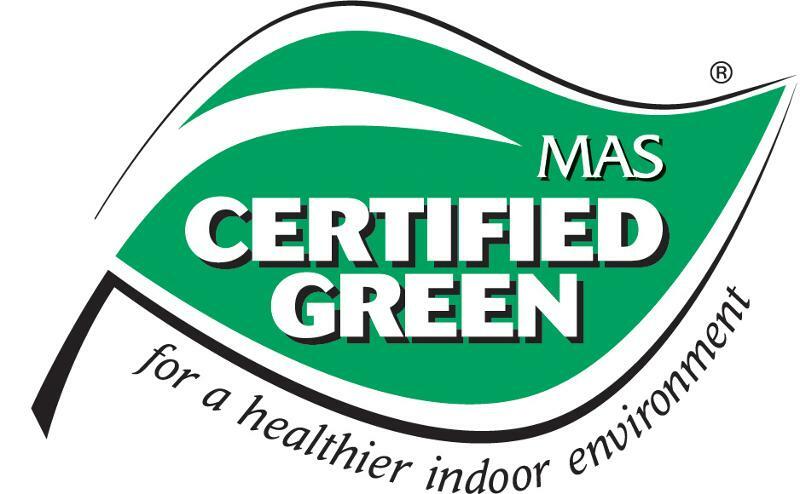 All Tandus Centiva soft surface products are certified to the Carpet and Rug Institute’s Green Label Plus program. The CRI GLP program was developed to test and certify carpet, cushion and adhesive products for VOC emissions. Products with this certification meet the requirements of California’s 01350 and are among the lowest emitting in the market. Tandus Centiva conducts VOC content testing and obtains third-party certification of the results for its adhesive products through Materials Analytical Services, LLC. This allows Tandus Centiva to provide quantifiable results demonstrating that VOC content is below the threshold limits specified by the South Coast Air Quality Management District (SCAQMD) Rule 1168. Two million lives are lost each year from breathing in tiny particles present in indoor and outdoor air pollution, worldwide [Source]. Poor indoor air quality leads to increased absenteeism, increased healthcare costs and lost productivity. Settled dust, which can be associated with “sick building syndrome” is a trigger for allergies and asthmatic episodes. We are committed to the development of products that establish and sustain healthy environments before, during and after installation. The construction properties of our Powerbond hybrid resilient sheet flooring has been scientifically shown to significantly reduce exposure to airborne particulates. We also choose not to include antimicrobial agents in our flooring products. Many antimicrobials used today are classified as pesticides and are potentially harmful when used in indoors. An effective cleaning routine is the best defense against unwanted spills, soil and contaminates. *Recycled content may contain legacy chemicals, including phthalates. For a list of phthalate-free products, contact your Tandus Centiva account executive. Acoustics – Silence is beautiful. Acoustics can enhance the environmental quality of a space by facilitating communication, increasing productivity, improving the well-being of workers or aiding in noise control and speech privacy. The benefits of open collaboration spaces can be balanced with acoustic design. In schools, acoustics are incredibly important because they impact communication between teachers and students. In classrooms with poor acoustics, teacher absenteeism tends to be higher due to higher voice strain related illnesses. In healthcare, acoustics play an important role in patients’ privacy and comfort. Careful acoustic planning can help facilitate confidential health discussions among patients and medical personnel. In green buildings, tradeoffs are often made between mechanical systems, materials and acoustics. In the evolution of green building design, the attempt to minimize materials has often meant removing the floorcoverings, an abundance of glass surfaces and exposing HVAC systems… all of which have had a negative impact on acoustics. A balance is essential, especially in those areas where acoustics are critical to occupant activities. Better acoustics do matter. Our products enhance sound in places where acoustics are critical. Tandus Centiva provides multiple solutions with demonstrated performance. For example, our closed-cell cushion technology supports Powerbond® and Flex-Aire™ Cushion modular tile, resulting in sound absorption and reduced reverberation times. Thermal conditions of indoor environments directly affect people’s satisfaction and performance. Surface temperature is one aspect of thermal comfort that can be impacted by flooring selections. We design our products to create a comfortable, enjoyable space. Powerbond and FlexAire’s closed-cell cushion construction offers ergo comfort with cushion and thermal insulation that maintains floor temperatures within one degree of the ambient temperature in the room. This saves energy and maintains comfort by preventing hot and cold transmission through the flooring surface. We strive to create healthy, comfortable and enjoyable indoor environments that ensure everyone's well-being during product installation, use and maintenance. We have developed innovative installation methods for soft surface products to reduce VOC’s, reduce installation down-time and make the product easier to remove and recycle at the end of use. 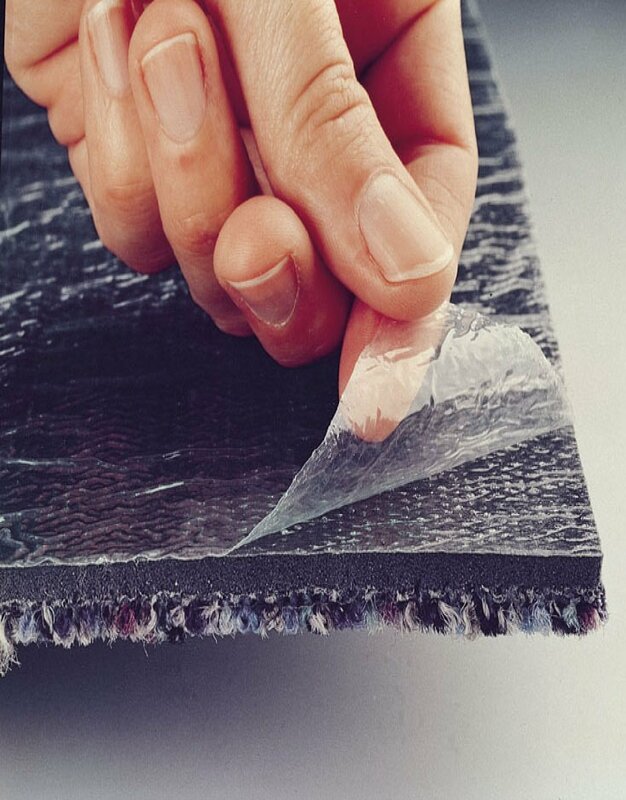 The RS Installation System is a pre-applied adhesive that allows for a “peel and stick” installation, eliminating the need for wet glue. Along with significantly reducing VOCs associated with new flooring installation and improving indoor air quality, we keep glue buckets out of landfills and save thousands of gallons of adhesives and transportation fuel. With no wet adhesives, no heavy buckets of glue, no messy clean up, and no odors we all breathe a little easier. Whether you need a permanent or temporary installation, breathe easy with TarkettTAPE. 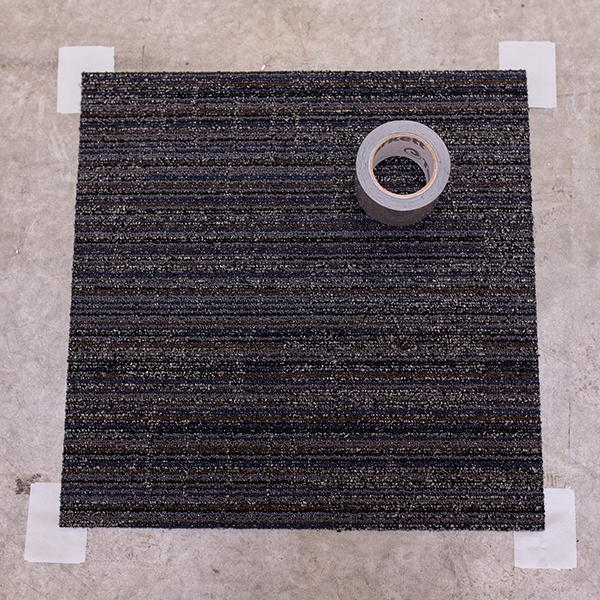 TarkettTAPE is for use on ethos® Modular with Omnicoat Technology™ and Flex-Aire™ modular carpet. For more information about TarkettTAPE, visit our Accessories page. Maintenance can be a significant contributor to the life cycle impact of a product. We design flooring to be easily maintained, using as little energy, water and chemicals as possible. LVT offers significant advantages over traditional resilient floors through life cycle cost savings in maintenance. Clean Green Maintenance products are environmentally preferred products that directly contribute to a cleaner, safer and healthier environment. These products have been specifically formulated to comply with the stringent requirements of GreenSeal’s GS-40/GS-37 standards as well as the EPA’s Safer Choice standards. Powerbond repairs are amazingly easy and effective! Local staff is trained by Tandus Centiva to make repairs with little down time and even less material requirements than carpet tile. Imagine making repairs without the use of floor adhesives. Imagine all of the square yards of carpet saved by not having to replace whole tiles for small spots and stains! Recycling/Reuse - Old flooring creates new possibilities. As the industry leader in carpet reclamation, Tandus Centiva knows a thing or two about recycling. We operate the flooring industry’s first third-party certified (2010) closed-loop reclamation and recycling facility in Dalton, Georgia. Since 1994, over 284 million lbs of postconsumer carpet and waste have been diverted from landfills. Our commitment to environmental stewardship allows us to proudly offer reclamation and recycling for all Tandus Centiva hard and soft products through the ReStart® Program, including Powerbond®, ethos® and vinyl-backed tile, broadloom and LVT.